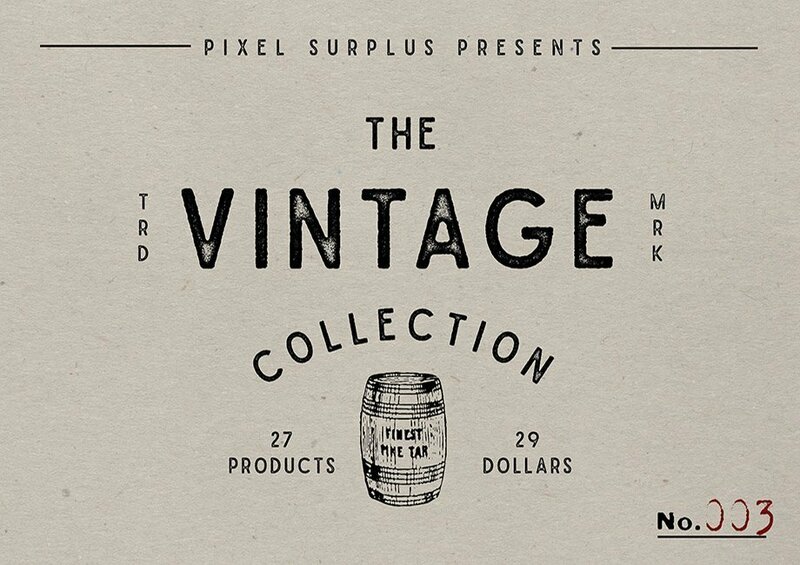 We are excited to be a part of the latest vintage bundle offering this month by Pixel Surplus. Our heritage DEADWOOD, and GOLDFIELD fonts are included as well as our 13 Handmade Grunge Textures pack. Back again with another Vintage Collection that is absolutely jam packed with variety, value & character. This month’s bundle includes 27 vintage inspired products from 15 different designers. We’ve done our best to make this bundle especially useful for a large array of projects you might encounter. Inside you’ll find 23 font products including display fonts, versatile sans-serifs, elegant scripts, layered fonts, hand drawn serifs and much more. On top of the great selection, several products also include 5 or more variations in style & texture so they are extra usable in many applications. On top of the fonts we have a retro ad creation kit, an old movie title creator kit, a grunge texture pack & 30 retro text effects. Do not miss out on this one! It’s only $29 and you can grab it here Pixel Surplus.